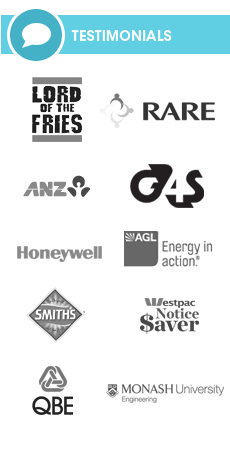 We supply cheap, promotional lollipops delivered Australia wide for an affordable price, with branded packaging personalised with your company’s unique custom logo or design. Lollipops are one of those delicious, convenient treats that kids and even adults can never have enough of, and if you’re planning to promote your brand in a way that’s both effective and affordable, it’s hard to go wrong with these colourful, custom-branded candies for your next event or campaign. 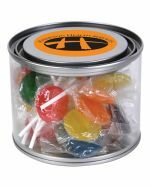 Whichever of our promotional confectioneries you choose, whether it be the cheap Standard Lollipops, the Lollipops in a Half-Litre Drum, or the customised 1 Litre Lollipop Can, we stock the perfect option to help promote your company to suit your personal marketing needs and budget. With years of experience and many satisfied customers, the team at Promotional Items imprint your customised emblem or brand onto the packages or containers of these tasty promotional treats, using the latest in printing techniques and technologies to stay a cut above the rest. The sweet taste and colourful nature of these delicious customised lollipops are certain to make your potential customers, clients and even staff feel valued, increasing the reputation and exposure of your brand amongst the wider community. Make your customers think positively of your company every time they have one of these delightful promotional lollipops, and as always, we guarantee the quality of our work so you can be confident to receive high-quality, customised lollipops whenever you order from us. 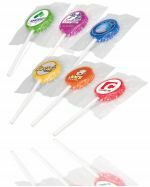 We supply a range of packaging choices for these promotional lollipops, to suit your current marketing budget and situation. 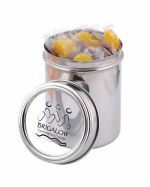 Select the large personalised lollipop container with an in-built dispenser for large events, the individually branded wrappers to hand directly to your recipients, or the unique cocktail container to make a big impression amongst your target audience, and get them talking about your brand. Of course, this is simply a guide, and the approaches you can use to distribute these versatile promotional lollipops are practically endless! 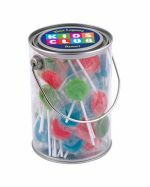 Additionally, if you require large quantities of lollies quickly, we also supply lollipops in bulk without custom-printed labels. 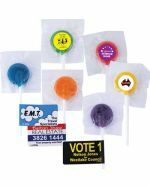 We stock our promotional lollipops locally and brand them here in Australia so that you can expect professional service, a rapid turnaround time and quick delivery to all states and territories. Give our friendly staff a call today to find an affordable deal on our amazing custom-branded promotional confectioneries for your next event or campaign, and have these lollipops promptly delivered to your location wherever you are in Australia. Why Promote Your Brand with Custom Lollipops? 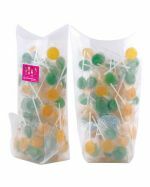 Because our promotional packaged lollipops have a long shelf-life of up to two years (if stored at a cool temperature in original packaging), they can be kept for an extended time without losing their colour or flavour, and then distributed to clients, potential customers and staff any time, at an event of your choice. Personalised candy and custom-branded lollies come in a wide variety of colours and flavours, and are some of the most recognised promotional tools to help your brand gain exposure and entice new customers to your business – therefore we offer you our stylishly-branded packaged lollipops emblazoned with your brand’s custom logo or graphics, to quickly get your audience talking about your company. What Are Custom Branded Lollipops? These tasty promotional lollipops are essentially hard-boiled candies at the end of a stick, making them affordable and convenient options for you to promote your brand with. They are made from a combination of sugar, water, corn syrup and flavourings which give them that sweet, addictive taste, and come with custom-branded packaging which is made from safe, long-lasting plastic or durable metal (depending on the product you order), personalised with your unique logo or design. All the materials and ingredients that we use in our promotional lollipops are of the highest quality and meet Australian standards, to ensure that you receive a superior product that you can be proud to distribute at your next event or campaign. Where Can You Use Promotional Candy? 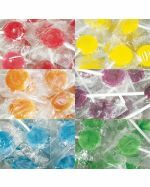 These imprinted packaged lollipops are perfect as promotional giveaways for your potential customers in any corporate or social situation, from event expos and job fairs, to university open days and local festivals. Pop them in promotional goodie bags or sample bags, or use them as sweet prizes in quizzes and games. Alternatively, give these custom-branded lollipops to your clients and staff as complimentary gifts to show them the appreciation they deserve, and that you are always thinking about them, or leave a bunch of them at reception for your clients to take on their way in or out of your office. These personalised lollipops are perfect for kid-friendly promotions, but who said there is an age limit to enjoy lollipops? Wherever and however you decide to distribute these appealing customised candies, you can be confident that they will leave a lasting impression on your target audience, and attract them to your brand no matter what product or service you provide.